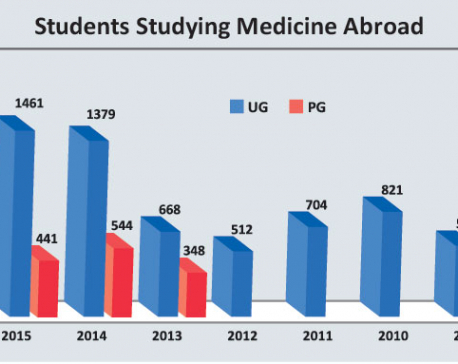 KATHMANDU, June 30: At a time when the government is showing the dream of prosperity to its people, the number of students aspiring for higher education in foreign countries has increased significantly. 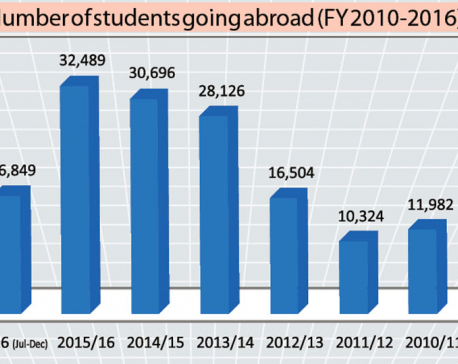 The Nepali students have now reached as many as 72 foreign countries for higher studies, as per the data maintained by the Ministry of Education, Science and Technology. According to Scholarship Section of the Ministry, it has so far provided no objection letters to 62,200 students till the date of this fiscal year alone. This number is nearly double that of two years back. In the fiscal year 2072/73BS, 32,489 students had got no objection letters, which grew to 50,659 in 2073/74BS. Section Chief Devi Prasad Upadhyay Poudel said 200 students on average were receiving no objection letter on a daily basis. However, those going abroad for study without approval letter are not recorded in the government document. Australia is the first choice for such students. For Australia alone, 33,ooo students have got approval for foreign study till the date of this fiscal. Second priority is Japan, while US the third and China the fourth. Very few students have applied for no objection letter at the Ministry for the study in Romania, Vietnam, Ukren, and Island. Chief Upadhyay stated that the applicants having required documents can get no objection letter within half an hour. Educational Consultancy Association of Nepal (ECAN) Chair Bishnu Hari Pandey has said more students were applying for higher studies abroad but it was unexpected. He however said all applicants might not have applied for study. Pandey added that the counseling institutions should give counseling to the aspirants for higher studies not for only earning abroad. He made it clear that ECAN was discouraging the likelihood of FDI in this sector, which leads to the collapse of Nepali's consultancy centres.